On June 2nd, 2018, I embarked on another cross-country summer tour. The primary destination is the Motorcycle Sport Touring Association’s national rally called STAR2018 at the Radisson Inn in LaCrosse, Wisconsin between June 10th and 14th. After the rally I tentatively planned to visit Colorado once again. Once again I am riding my 2015 BMW R1200GS-Adventure motorcycle on this tour. During the tour my Spot Messenger device again sends location updates to the Spotwalla web service to track my path and shows my current location during my journey. On Wednesday I arrived at the home of my friend, Tim, in Ladysmith, Wisconsin. The trip thus far has gone quite well, apart from enduring some heavy rain and hot temperatures in northern Florida while starting out on Sunday. My BMW R1200GSA has performed flawlessly. On Friday, 6/8/2018, I rode south to La Crosse and checked into the Radisson hotel hosting the MSTA rally. That evening I joined six other MSTA members for a wonderful, albeit expensive dinner at a nearby restaurant called “Lovechild“. On Saturday, we began the process of registering members arriving for the STAR-2018 rally. On Thursday, 6/14/2018, I departed La Crosse and rode westward across Minnesota, Iowa, Nebraska, stopping in Norfolk, NE for the night, and continuing into Colorado on Friday. Since arriving at my friend KC’s home in Boulder, I have been relaxing and hoping for breaks in the weather for opportunities to go riding in the mountains again. On Monday, the weather cleared enough that I was able to ride along CO-7, a.k.a. 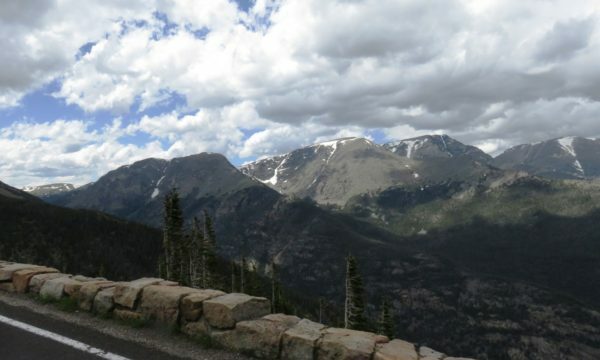 the Peak-to-Peak Highway, from Nederland to Estes Park. 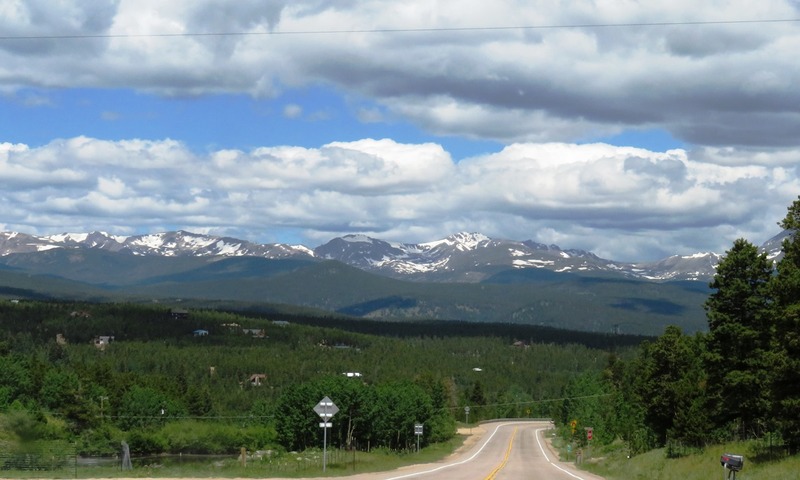 Initially the weather was overcast or even foggy at times, but cleared to partly cloudy as I neared Raymond at the junction of CO-7 and CO-72. The rest of the ride into Estes Park was pleasant and sunny. I even rode to the near the top of Trail Ridge Road at over 11,000 ft elevation, stopping at Forest Canyon Overlook. Since the weather was so gorgeous today, I went for another jaunt on the bike. This time I rode south along CO-93 to Golden Gate Canyon Rd (CO-46), west to Peak-to-Peak Highway (CO-119), north towards Nederland, stopped for lunch at The Last Shot Restaurant just south of Rollinsville, and after a delicious omelet I returned to Boulder via Coal Creek Canyon (CO-72) and CO-93. Following my excursion on Wednesday 6/20, I watched the local weather forecast that evening and learned that the weather on Thursday would be good early in the day, but become rainy and even stormy late in the day and through the weekend. That news in addition to the reports about forest fires in various areas in Colorado caused be to make the decision to start heading back to Florida right away. Therefore on Thursday morning 6/21, I thanked my friend K.C. for his hospitality and started eastward under clear, blue skies towards Kansas to begin the first leg of my journey home, initially on US-36 and I-70 as far as Byers, CO, where I then continued eastward on US-36 into Kansas and stopped for the night in Salina, KS. The next day, Friday 6/22, I continued on my route into Missouri, just north of Joplin, where I stopped to check on the wear of the rear tire. Seeing that it was nearly at the wear bars, I decided to look for a BMW dealership where I could have the tire replaced. Thankfully, the BMW dealership in Bentonville, AR was able to accommodate my needs with minimal delay. Following that brief stop, I continued eastward across Arkansas to the city of Mountain View, where I had made a motel reservation. The next morning, Saturday 6/23, was another beautiful day for riding, although there had been a light rain during the night. My route turned more southeasterly or southerly as I headed towards Demopolis in southern Alabama for my next night’s stop. I ate dinner at Smokin’ Jack’s BBQ next door to the motel. On Sunday 6/24, I was greeted by yet another day of beautiful, although quite warm weather for the penultimate day of my trip home. Although I had studiously avoided Interstate highways most of the way thus far, I did ride on I-10 from Marianna, FL to the exit to US-19 near Drifton, FL. I decided that I had ridden long enough in moderately heavy traffic with numerous semi-trucks and was ready for a more leisurely ride. Therefore I followed US-19 south through Perry as far as Chiefland, where I switched to US-27 and passed through Bronson and Williston until I reached Ocala. As I was nearing Ocala, I became concerned about a large thunderstorm cell just west of I-75. Thankfully it stayed away from my route. Since I had stayed there may times previously, I made a reservation at the same Quality Inn motel on SR-200 (SW College Rd) and had another good dinner at the adjacent Ruby Tuesday restaurant. After breakfast on Monday 6/25, I departed the motel just before 9 AM and resumed my journey south along I-75 and the Florida Turnpike. Once again I was lucky with the weather until just past Fort Pierce, where I did encounter a moderate shower, although thankfully not heavy enough to stop. I arrived back in Jupiter at my storage locker at 12:03 PM. This concludes my travelogue report for my Summer Tour in 2018. As time permits over the next few weeks, I may update this report with additional commentary and photos from my tour.